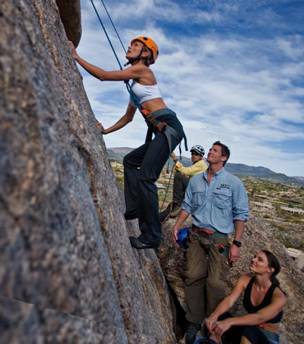 Experience the thrill of real rock climbing on the resort’s majestic granite. Yes, you can do this! 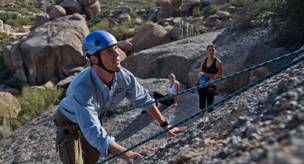 Our program is a genuine rock climbing experience, with natural routes rising up to 75 feet. Exhilarating! Climbing relies on technique, not raw strength, so participants are often surprised by their own abilities. Our expert guides supply all the gear and teach the basic skills. Yes. Most of our participants have never climbed, or have only climbed indoors. Everyone is, to some degree. That just means you’re normal! How strong or fit do I need to be? Upper-body strength is not a factor. If you can climb a tall ladder, you have the physical ability for rock climbing. Is it true women often out-climb men? Yes. Climbing is all about finesse. bouldering, or scrambling is allowed.